I've been finishing up some Bottles of Hope for my guild, and I thought it might be useful to talk about some tag options. "I told my friends to just make a wish, write it down and put it in the bottle, and it would come true. I don't know why, but we all just believed this... maybe because we just wanted to, or that it was something to hold on to." Slip of Paper Wishes: This is a simple way to include a message in a bottle without a lid. Print and cut out the message on a narrow slip of paper, then let the paper peek out of the bottle's top. Idea Source: dragonflypath's Bottles of Hope. Rolled-Up Wishes: Here's another wonderful option for bottles without stoppers. Print your message on a piece of paper slightly taller than the bottle, then roll it up scroll-style and put it inside. Idea Source: Thejoyof's Dinner Party Bottled Fortunes. Accordion-Style Wishes: To enclose a long, thin quote in a bottle that has a lid, fold your piece of paper accordion-style and attach the paper to the lid. When the recipient takes the lid off, the quote comes with it! Idea Source: Fellow guild member, Lee Ann K.
Wishes on the Outside: Another option is to punch a hole in the paper and tie it onto the bottle with a ribbon or rubber band. And what should you write (or print) on the slips of paper? It's totally up to you: use anything you think would be inspirational to someone. The Bottles of Hope site has PDFs of various quotes you can print and include. See Tags [PDF] and More Tags [PDF] on this page. A friend and cancer survivor offered me one of her books to use for tag inspiration: The Language of Courage and Inner Strength . It's full of courageous quotes that work well. Here are a few of these quotes I've formatted to print for Bottles of Hope: Courage Quotes [PDF]. Many similar quote books are available. Check your library or local hospital gift shop, or just search Google for inspirational quotes. Some of the best bottles I've seen have a quote that fits the theme of the bottle. This is sometimes easier to do if you find a quote you like first, then create a bottle that embodies that theme. 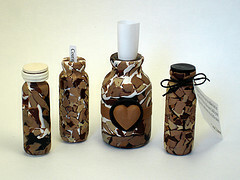 Of course, the love that's shown by making and donating these handmade bottles is often enough of a message. So don't feel obligated to add a written message to every bottle. I'm fairly new to Bottles of Hope. I imagine those of you who have worked with them longer have some other ideas for both how to include a message and what types of message work best. I'd love to hear your suggestions. Tips for finding quotes to use for Bottles of Hope, plus several suggestions for ways to enclose those quotes in the bottles. I love making them. I put a short message on the ouside in clay because I don't know if the person speaks french or english. We are bilingual here. The info seen here inspires me. To see some of my bottles go under Bouteilles . Louise, Your bottles are wonderfully imaginative -- thanks for sharing them! those are GORGEOUS. and i love their purpose. the one with the heart is my favorite. love! Thanks, Leanna. The heart one was actually featured in the story our local Telemundo station did about my guild's involvement in Bottles of Hope. The interviewer asked me the meaning behind this particular bottle, and I realized I hadn't really gone into that here. I was going for a camouflage effect, and each of the slips has a courage-themed quote. I created them with the thought that some cancer patients see themselves as soldiers fighting a battle. I'd love for these bottles to provide additional strength and courage in that fight.